Do you need a little help getting your finances into shape? Let us help you trim those extra dollars off your budget! 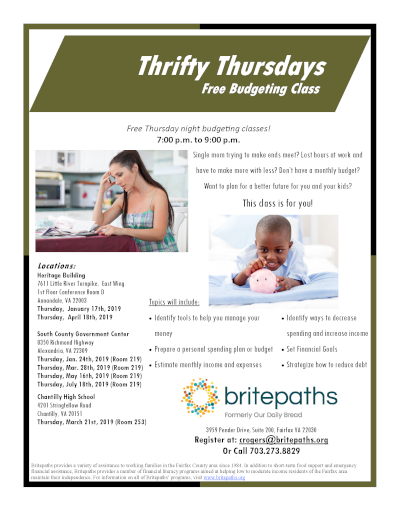 Free, one-time classes are open to the public and offered to anyone in Northern Virginia interested in learning about budgeting and credit reports. Classes last 1-1/2 hours and are held on a monthly basis throughout Fairfax County. To participate, please RSVP to Carole Rogers at crogers@britepaths.org or 703.273.8829.